In the lead-up to their bout last night at the NTU Sports Center in Taipei, Taiwan, Cordilleran mixed martial artist Eric "The Natural" Kelly and Australian Rob "Ruthless" Lisita promised a war. Well, they more than delivered. 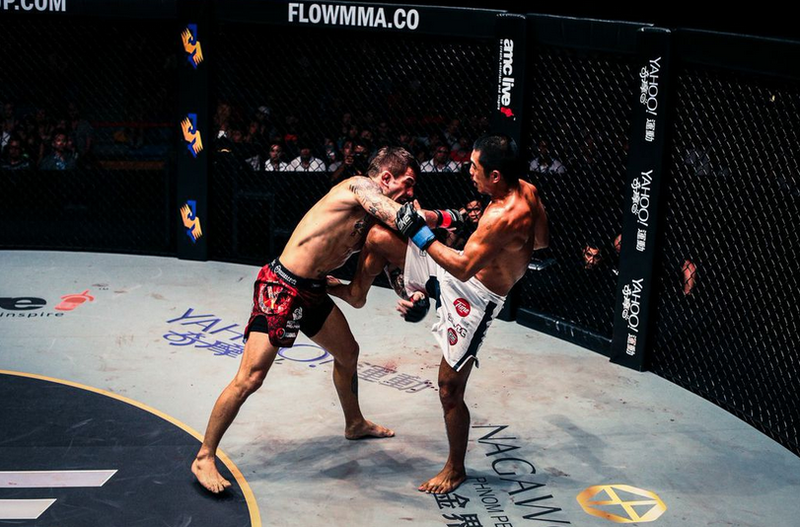 At the main event of One Fighting Championship: War of Dragons, they stayed true to their words and traded punches from the moment the cage was closed and the bell was rung. The affair which lasted for only two rounds had both fighters attempting submissions. The scramble was not surprising as both fighters are submission specialists. The first round was both a striking and grappling match. Kelly and Lisita traded punches, kicks and knees when they were on their feet. On the ground, they found themselves attempting to submit each other. In the second round, the fighters picked up from where they left off. Lisita had the better of the exchanges and was able to bust Kelly's nose from which blood started gushing out. Kelly's nose was bleeding so bad that the referee had to give a temporary halt to the bout to have a doctor check on Kelly's nose. When the fight continued, the two combatants went for another grappling match. In the end, Kelly took Lisita's back and immediately locked in a rear-naked choke. Lisita tapped out at the 3:43 mark in the second round. With the win, Kelly improves his record to 11 wins and 1 loss while Lisita drops to 14 wins and 6 losses. The victory also provided Kelly with the chance to fight for the ONE FC featherweight belt which is currently held by Koji Oishi of Japan. Oishi is scheduled to defend his title this coming August in Dubai against an unnamed opponent. Kelly will likely be that opponent as long as he can heal fast enough from the injuries he incurred with the fight against Lisita. If you missed the fight, here's a GIF of Kelly's rear-naked choke victory over Lisita. You have to wait for a few seconds for the GIF to completely load.